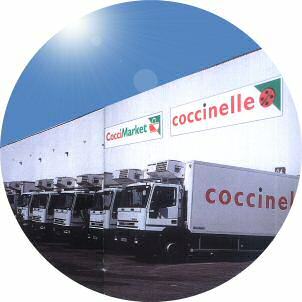 The Cocci Market trade name is for small, local super markets of less that 400 sq meters which specialize in fresh products and have quick access for essential consumer staples. The trade name?s logo is a basket within a triangle which emphasizes its staying power. The red and green of the logo, symbolic of freshness, has been kept as it has been in the Coccinelle Markets, to remind us of the recognized values found in local businesses. Because of its location, CocciMarkets are especially noted for consistent product quality, great choices, individual advice, and the ability to customize special offers according to clients? individual needs. The ability to purchase forgotten or staple items quickly, is made possible by the availability of a complete and varied selection of products in which the Belle France brand is widely represented. Additionally, small quantities may be purchased individually, and store hours are convenient as well as extensive.